Again this year Christmas was a blast and a delight. My favorite part is all the food and spending time with family! Christmas Eve had us heading over to my family where we ate and exchanged gifts. This year Christmas Eve dinner was held at my Aunt’s house and everything she does is over the top. I could write a whole blog post on Aunt Cindy. I am definitely a type “A” personality, but you haven’t seen anything yet until you meet her. 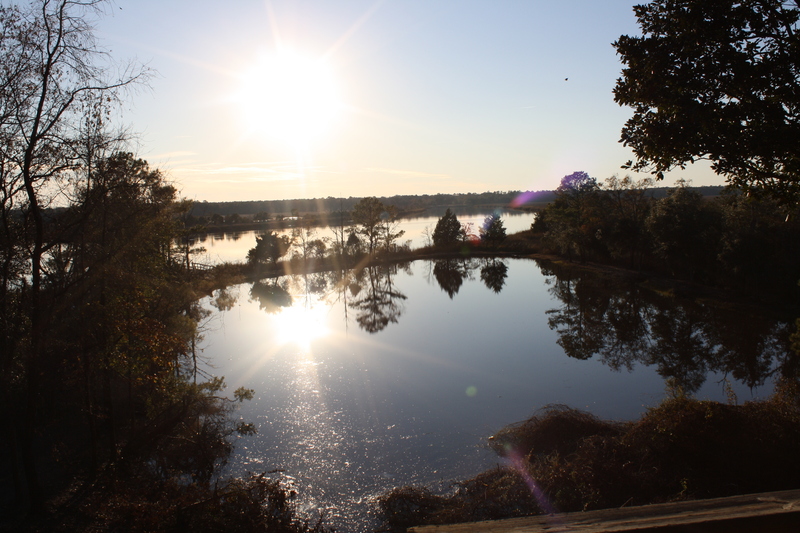 This is her gorgeous backyard overlooking the Ashley River. The sun was setting on this glorious afternoon. 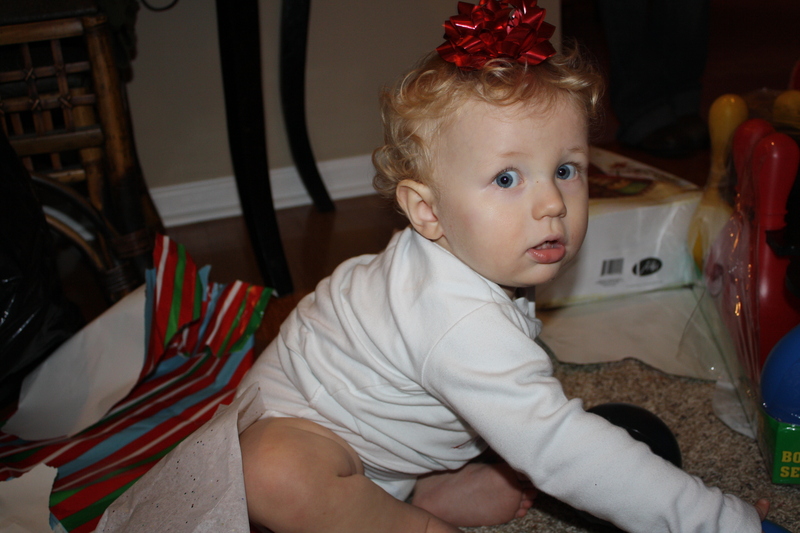 Evan really wasn’t too interested in opening gifts. 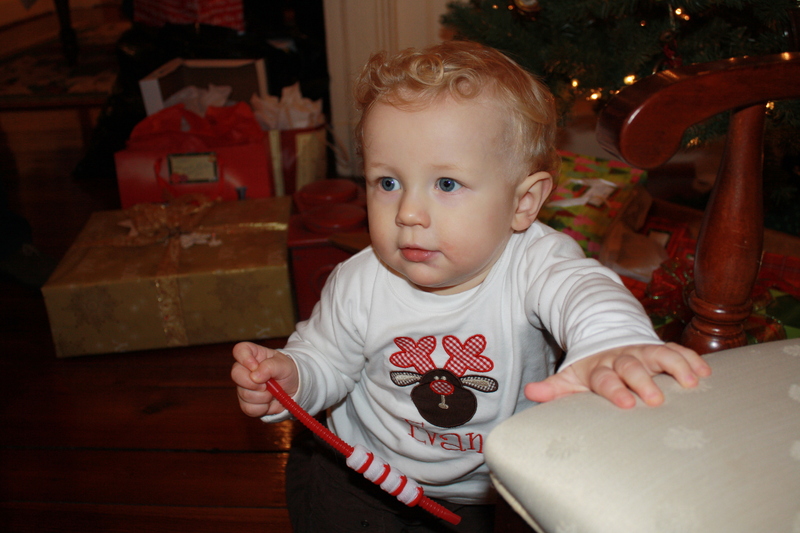 He stole this straw from his Uncle Seth and was perfectly content playing and chewing on it the whole time. 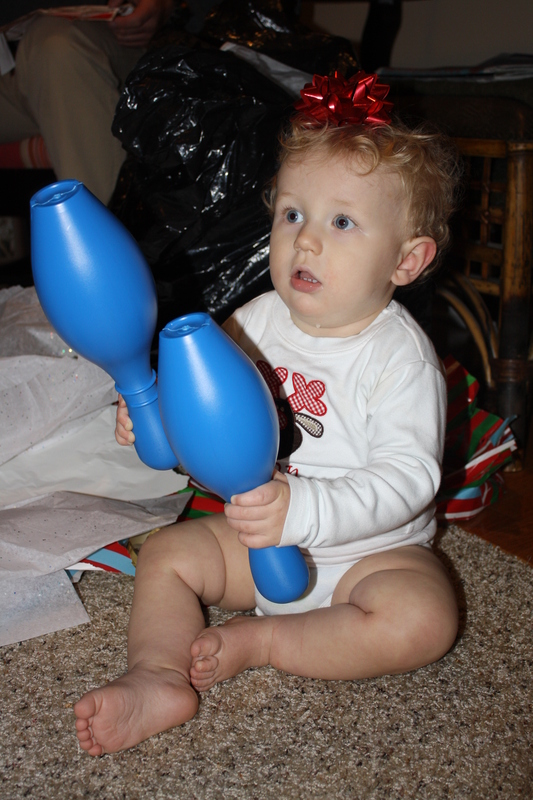 You can always tell which gifts are from Aunt Cindy. Notice the gold present in the background with the huge elaborate bow. And yes, all of her presents are wrapped like that. 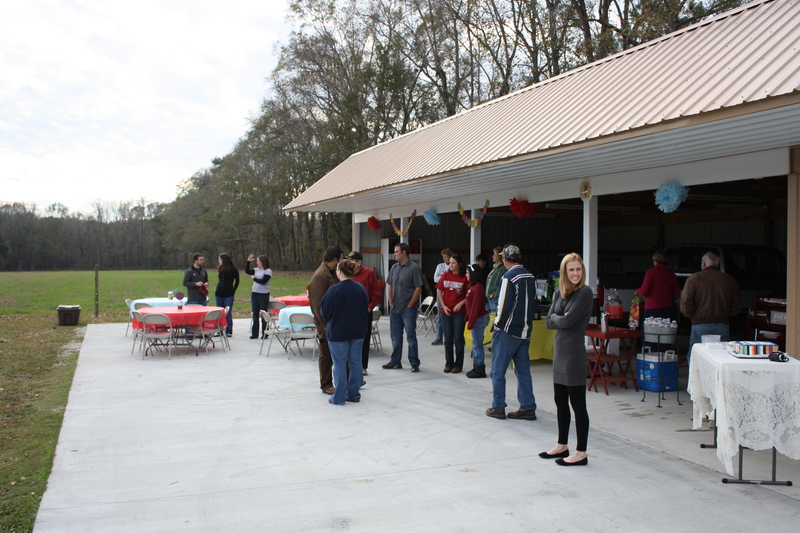 On Christmas day we headed over to Lovebug’s family for more food and more gifts. 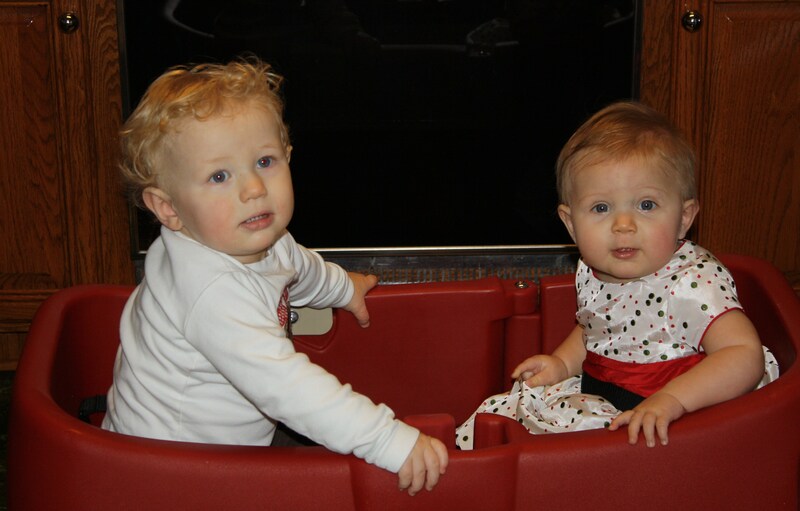 Evan and his cousin Emma strolled around Papa and Nana’s house in their new wagon. You can tell what Evan is thinking: “Mom, why is Emma in the wagon with me?” We are still working on the whole sharing thing. Evan is wearing the same shirt as he did on Christmas Eve. No worries, I washed it. I wanted to buy two different “Christmas” shirts with Evan’s name on them so I could avoid washing clothes on Christmas Eve, but a certain someone did not understand this reasoning. I’m not naming any names, but all I will say is that he happens to be my baby daddy. 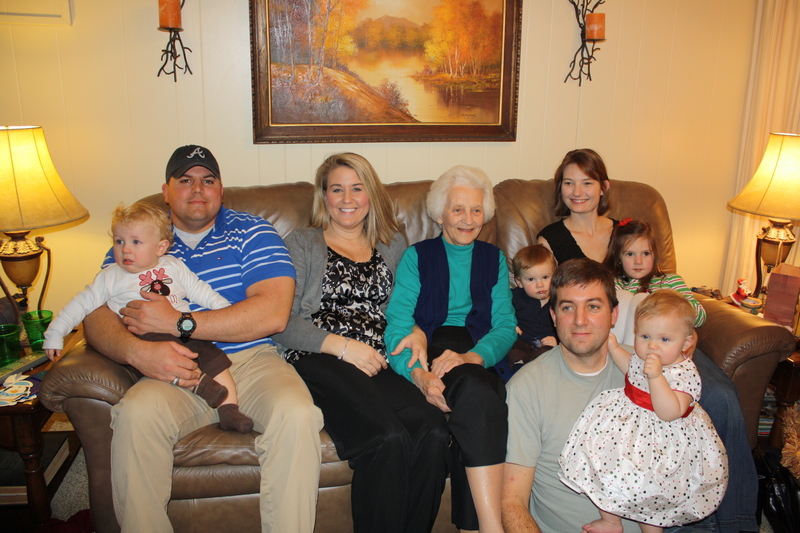 After we left Lovebug’s family, we headed to Moncks Corner to my parents’ house where we yet again ate and opened more presents. The day after Christmas we actually got some snow here in Charleston! 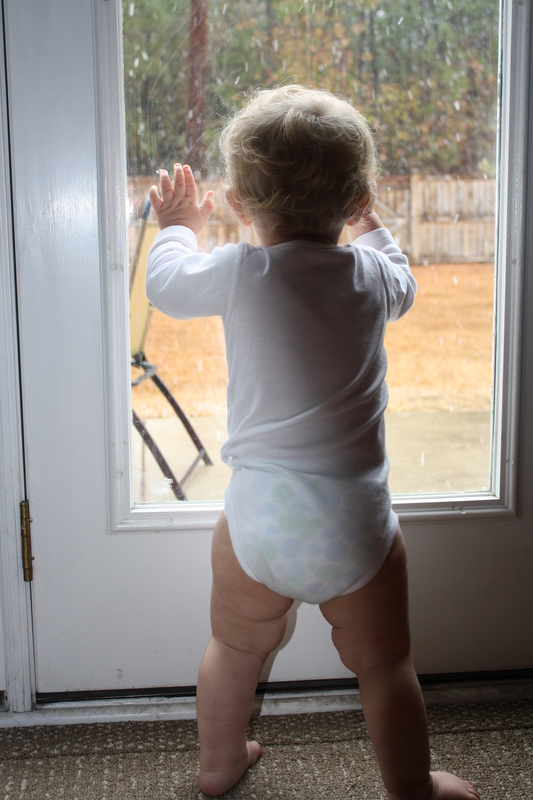 Evan and I were so thrilled that we just looked out the window. Unfortunately, the ground was not cold enough to make the snow stick. But it was still beautiful to watch. My husband came home after working a 14 hour day and started telling me how his day went, just like he usually does. He always starts the convo by saying it was just another busy day in the county (as a reminder, Lovebug is a K-9 officer for the local sheriff’s department). He continues on and tells me the order of events of his day. I’m following along and trying to be attentive. I have heard so many stories about people and what they do, that I too believe that people are absolutely crazy. Not only that, but they also lead very strange lives. This is almost verbatim how he told me the story. Again, none of this is too alarming for me. I’ve been married to a cop for 6 1/2 years and have heard pretty much all of it. I asked Lovebug if he even used Eiko, his K-9 partner. He said no. I’ve already told him a million times that I do not understand why he even has a drug sniffing dog. I did find it interesting that this is Lovebug’s second time in about two weeks finding drugs on a female hidden in that certain area. It makes me think…is this a new trend?…is this a conspiracy?…and how and/or why can my husband smell drugs hidden there? Do you sell or use the drugs that you hide there? P.S. I must now go and quarantine my husband, and administer vaccination shots. almost here and I am NOT ready! I really do not know what my problem is but I can’t seem to get motivated or get in the Christmas spirit. I know I probably sound like a Grinch, but I’m usually not like this. I’ve always been the type that puts their tree up the day after Thanksgiving. And now, well, we still don’t have ours up. It is very embarrassing writing that. And please don’t tell Evan! I have been busy though. Here is what has been occupying me. 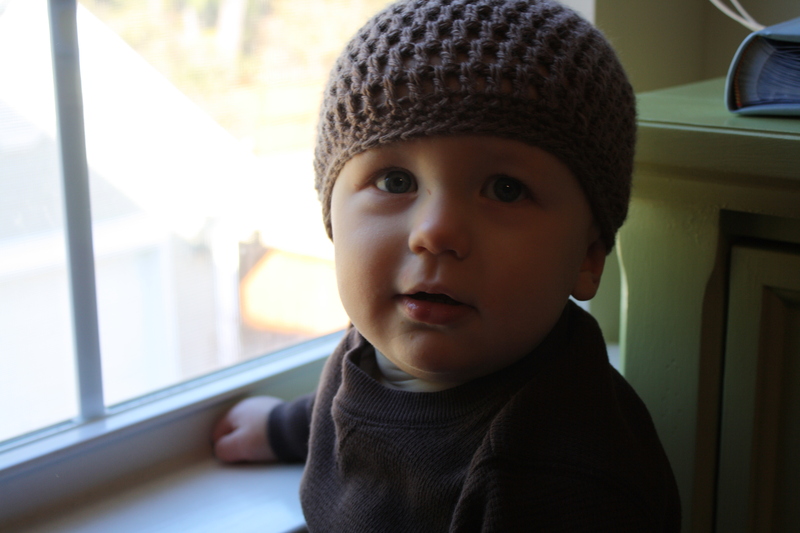 Also, on his head is a hat that I crocheted. I’ve been on a roll making these hats. Actually, you can now refer to me as Butter because I’m on a roll Baby! Every time I make Evan one, I have to make a matching one for me. I just think we are the cutest thing together in our matching hats. There is a downfall though. 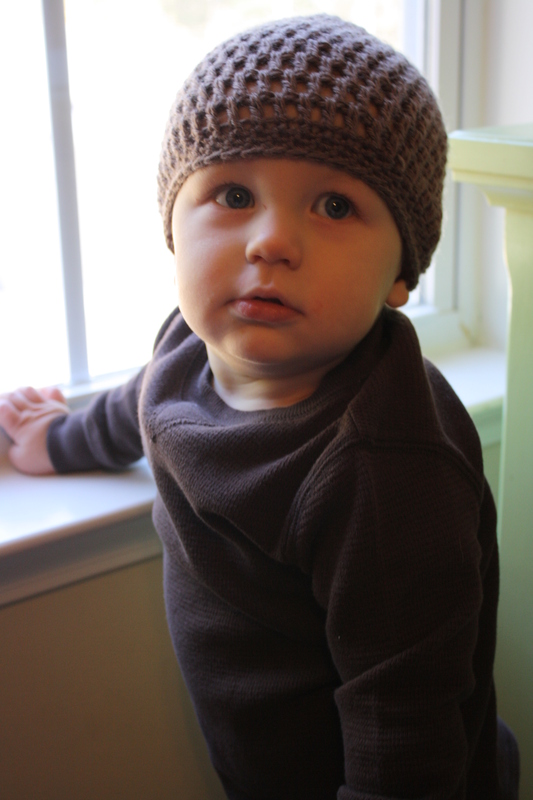 I am supposed to be making these as gifts and needless to say, every hat I make I end up wearing. Please do not be weirded out if I give you one of these hats for Christmas and it smells like Tresemme shampoo and conditioner. Thank you in advance for your understanding with this matter. The results are in! I will first say that we were somewhat surprised at Evan’s weight when we put him on the scale at the doctor’s office. Of course he was still way off the chart for his weight, height and head size. We just thought he weighed a little more. 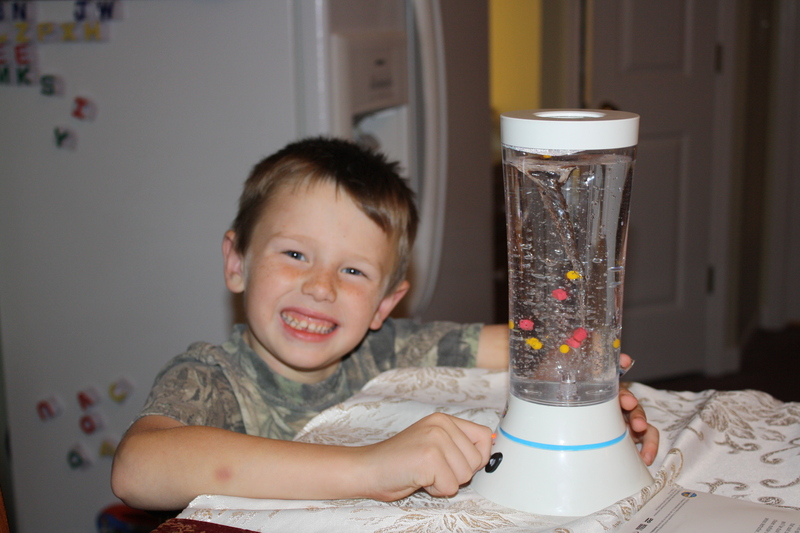 He is 33 inches tall, head size is 20 inches, and he weighs……..29 pounds 12 ounces. The winner is Mrs. Cindy Spurgeon. Yay to Mrs. Cindy! She is the only one who didn’t go over with her guess. Evan’s weight gain has really slowed down. 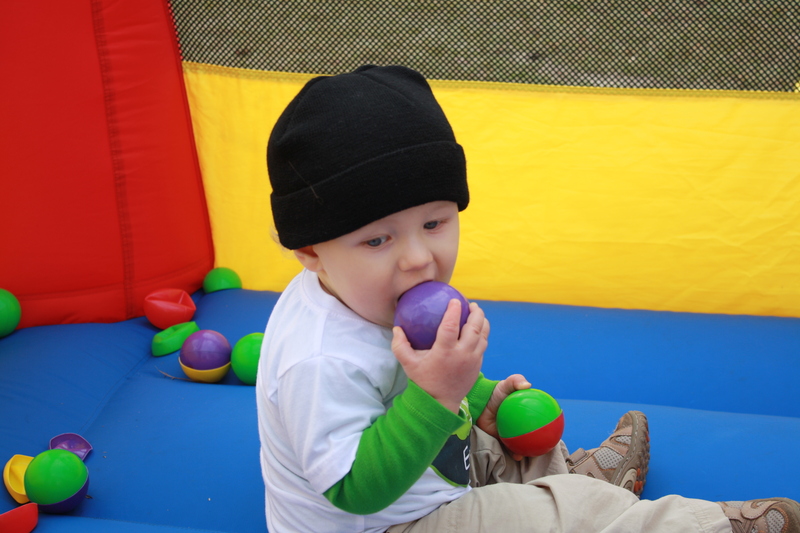 Several months ago Evan’s pediatrician told us he thought it would, mainly due to him being more active. I think it has been a combination of his NON- STOP movement, teething, etc. Plus he did a major poo right before he got on the scale, so that definitely set him back a couple of ounces. Overall, Evan’s health is great. 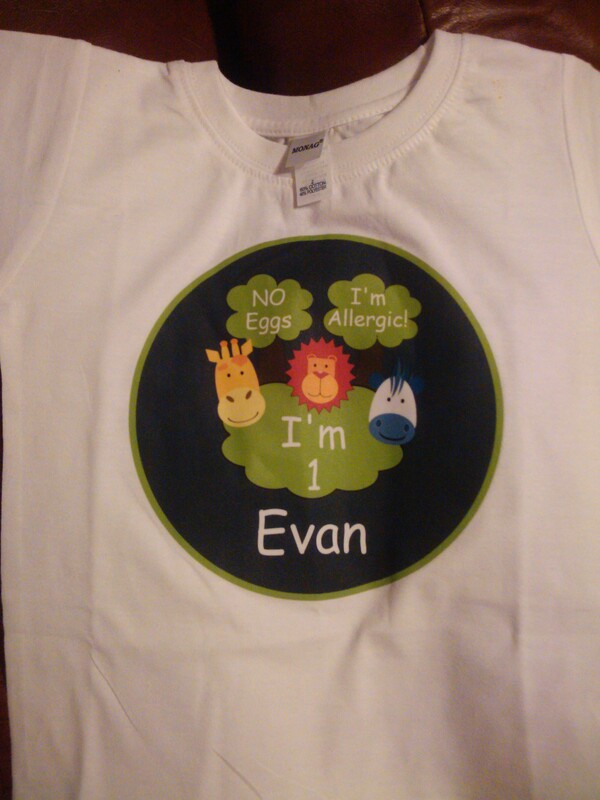 I have been a little concerned about Evan’s size for a while. To be honest, I thought he might have some form of gigantism. 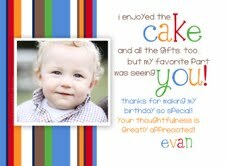 Thankfully, the doctor eased my concerns and reassured me that Evan most likely didn’t. I do have valid reasons for my concerns. Lovebug weighed 31 lbs but was only 30 inches in length at one year of age. He was shorter and “healthier”. Evan is 3 inches taller! He has grown over a foot since birth. His length at birth was 21 1/4 inches. A huge thanks to everyone who played along. We will definitely have another giveaway soon! My baby is ONE! Well, officially he will be on the 8th. 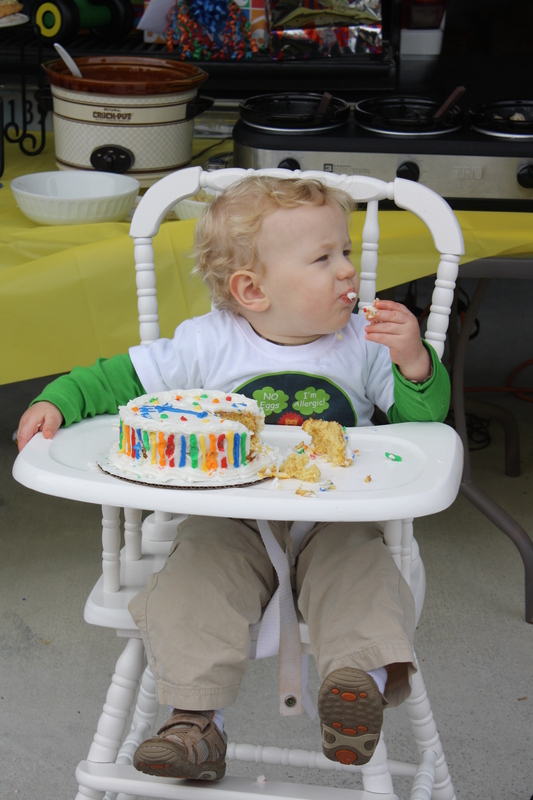 Evan’s FIRST birthday party was this past Saturday and just let me say that I am glad it’s done and over with. I think it was a hit, and I was filled with joy, but I just have the tendency to stress out way too much sometimes. I just get too overwhelmed, even when it came to choosing balloon colors. Needless to say, I gave up on the balloons and there were none at the party. 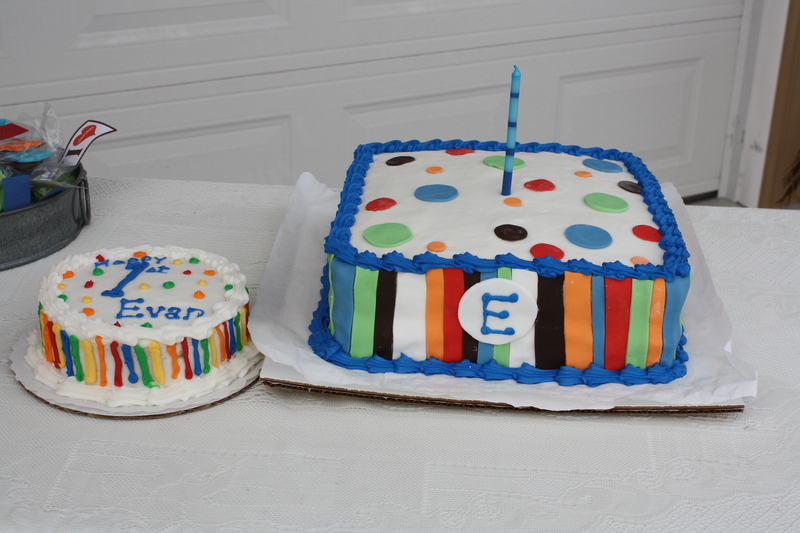 Enough about my OCD and anxiety, on to Evan’s FIRST birthday! The first stage of the birthday planning process started with creating these adorable invitations. Please excuse the somewhat distorted picture, as I had to crop out the address and phone number. The next step was making the envelopes for the invites. 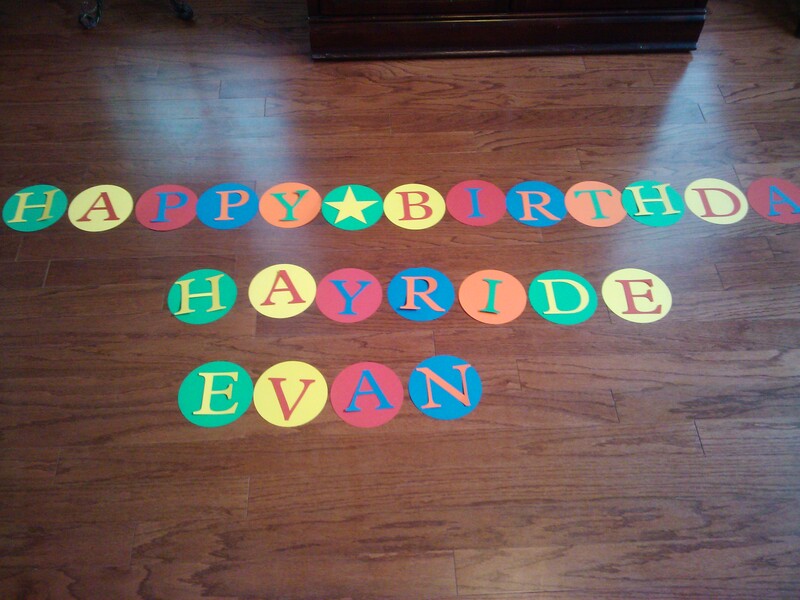 This is where my Cricut machine makes his first appearance in the birthday planning process. Let me just say how much I love my Cricut! He is just so talented and can do many amazing things. I really don’t know how I survived without him! One of my Cricut cartridges makes this cute envelope and it closes in the back with a ribbon. 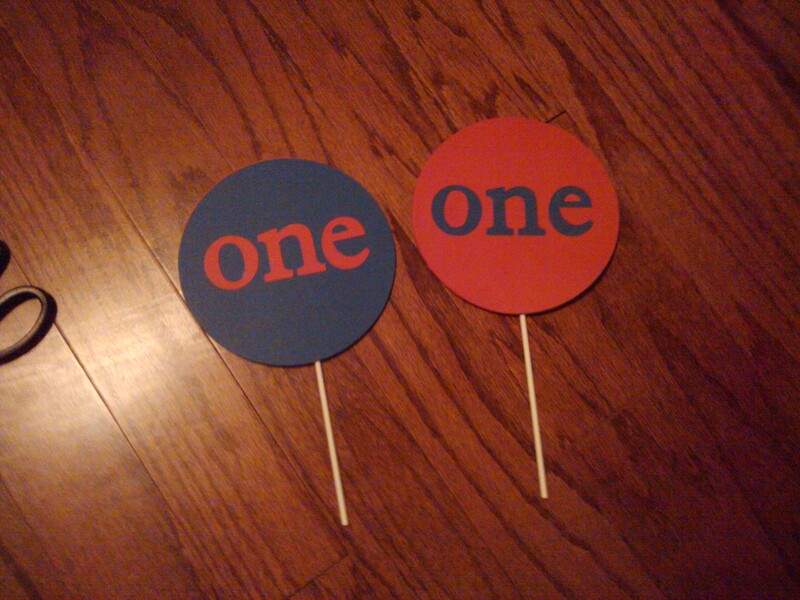 I made these “one” signs and used them as the table centerpieces. I placed them in Mason jars filled with big gum balls. The day of his party Evan woke up with a 102 degree temperature. 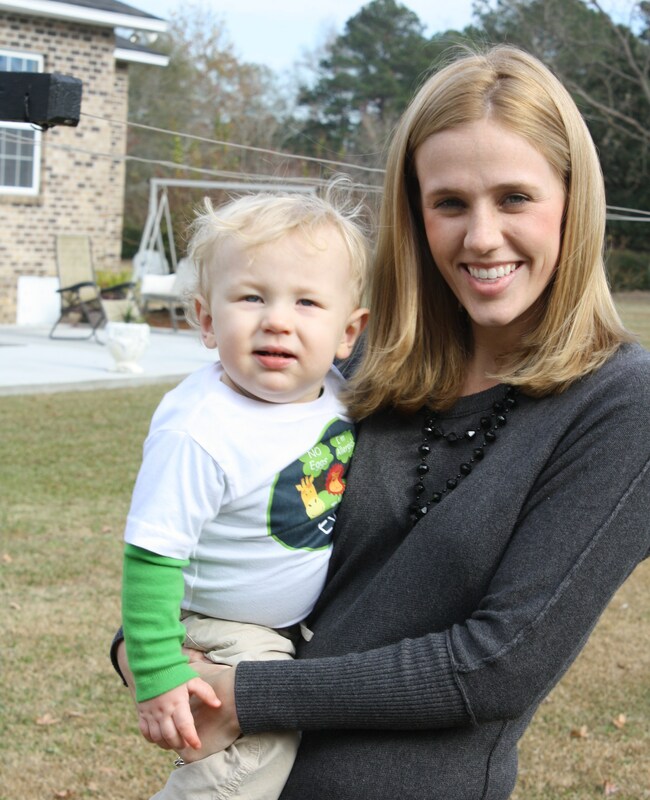 Teething baby + fever = one cranky baby and one frantic mom. Fortunately, Evan’s temperature subsided but it was obvious he still wasnt feeling well. 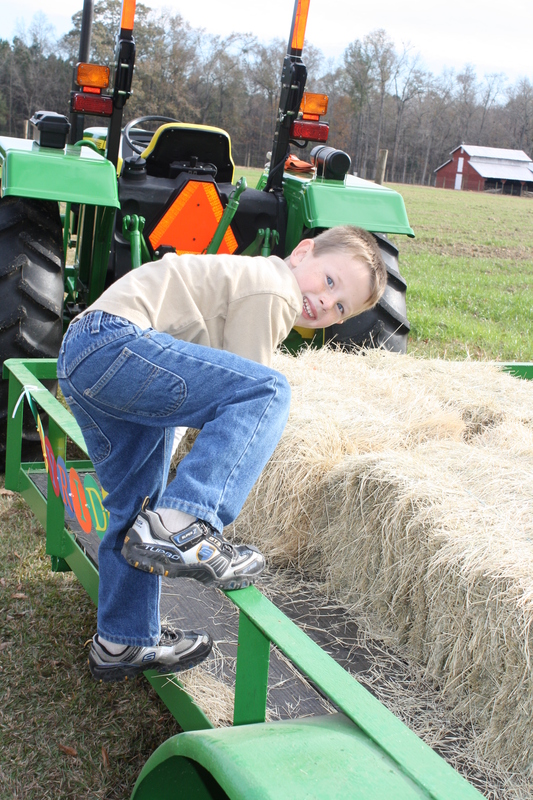 Evan absolutely insisted that there must be a hay ride. 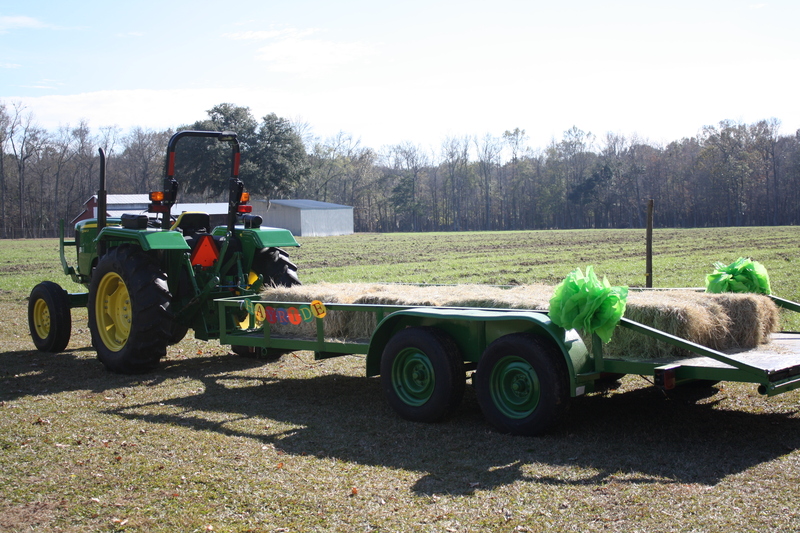 He is in LOVE with his PaPa’s tractor and wanted to take everyone on a spin around the farm. Some of Evan’s first guests arriving. 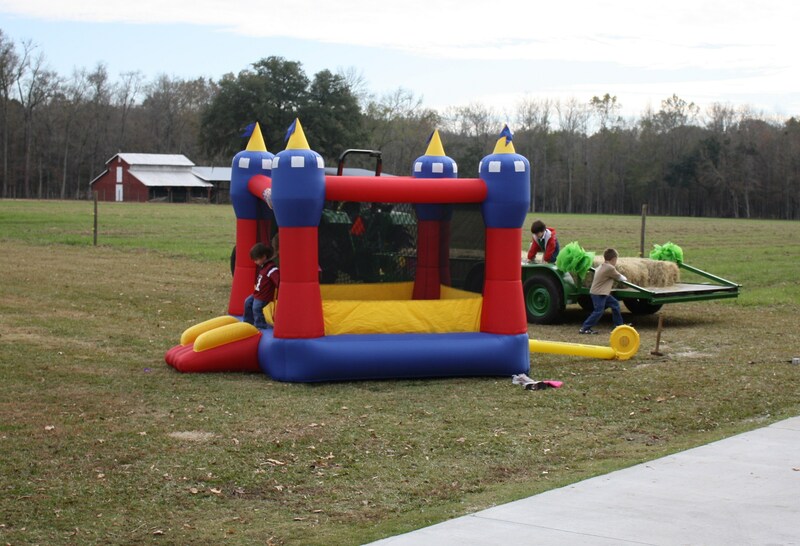 My BFF let us borrow her jump castle which I am so thankful for because it was definitely a huge hit with the kids. The party favors. It may be hard to tell, but they are chocolate “ones”. Evan was spoiled with so many gifts. 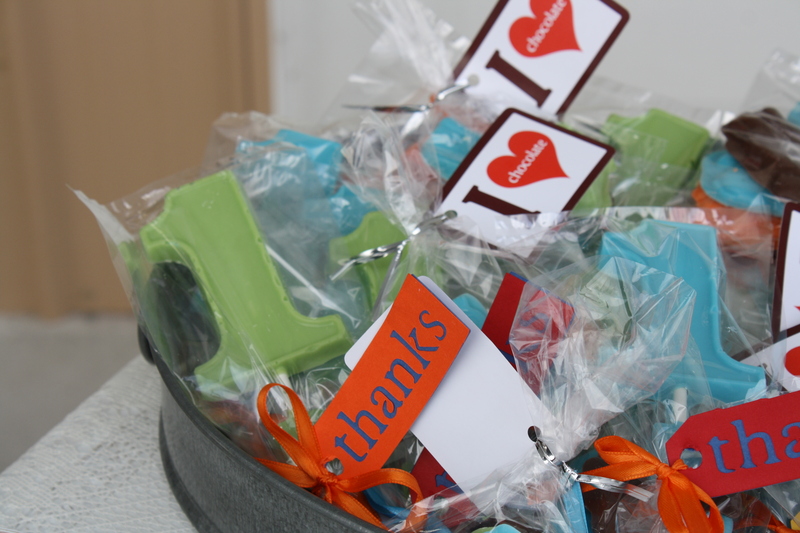 There were a couple of gifts, unfortunately, that we were unsure who they were from. So let me say to them now, whomever they may be, THANK YOU! Thank you, thank you, thank you to everyone who helped with this special day! Now on to the giveaway. I’m excited to announce my first giveaway. Before you get too excited and lose focus on what you’re doing, let me tell you what the gift is. Drum roll…a little more drums….a little louder….ok, that will be enough. 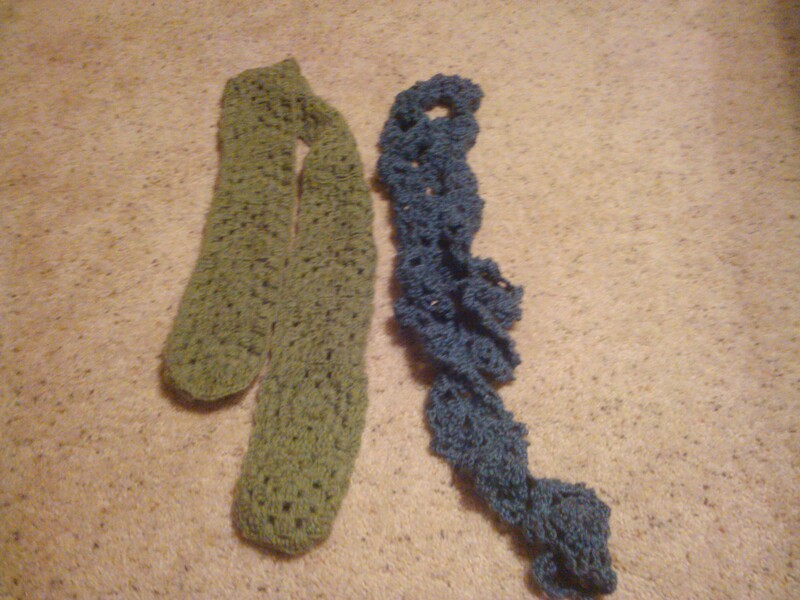 It will be one of my handmade scarves. I know you’re just thrilled. No worries if you do not like these colors. I have made others. Please enlighten me and play along. Don’t be shy, JULIA! Yes, I’m talking about you Julia, the only Julia I know. Even if you don’t like it, you can always re-gift it. I know I do have some male followers, so Rob you can always give it to your lovely wife if you win. I think I’m having too much fun louding people out. I will quit now. Hopefully you get the point and will play along, it will be fun. Also, you don’t have to live in Charleston, I can mail it. Family members may play along too. Don’t worry, none of them have a scale that can measure down to ounces. The rules are as follows: The closest one to guess Evan’s weight at his 12 month appointment WITHOUT GOING OVER wins. It’s that simple. To help y’all out, I will list all of Evan’s weights from his well baby check-ups. One year: Your guess is as good as mine! Please leave your guesses through the comment section. The deadline is this Sunday. Typically the majority of the civilized population on this planet we call Earth, spend this glorious day of good deals shopping until they cannot shop anymore. Well, we were not in that majority this Black Friday. We traded crowded shopping malls and grown adults fighting with each other over a toy for their kids, and headed over to Lovebug’s parent’s house to take part in a grand event. 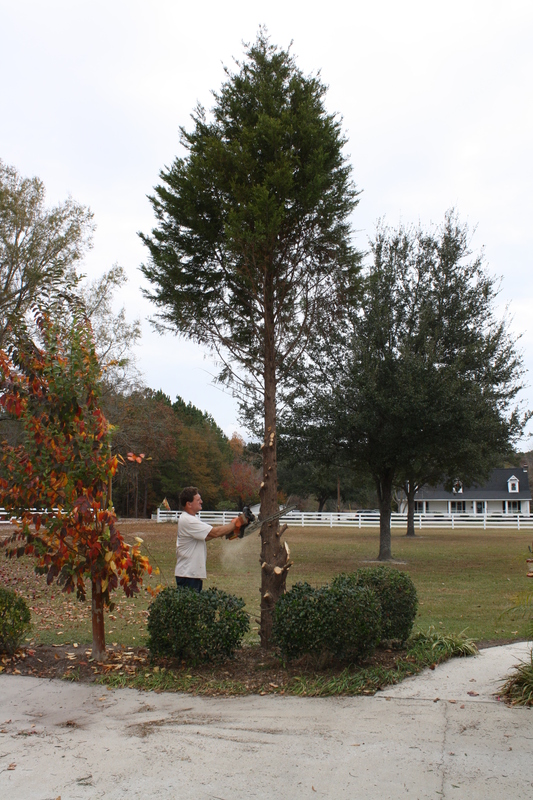 This spectacle being the “chopping down of the Christmas tree”. I was perfectly fine passing up the opportunity to find good deals in order to witness this event. 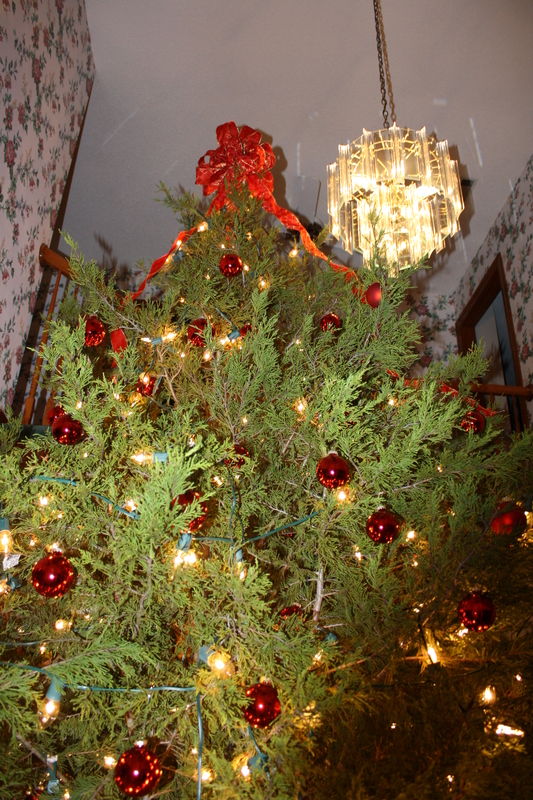 My father-in-law got the idea for this years Christmas tree to be part of the Leyland Cypress in their front yard. I say part of, because the entire tree stood about 30 feet tall, and there was no way the whole tree was going to fit in their home. If my wonderful father-in-law, a.k.a. Clark W. Griswold, could have made the whole thing fit, he would have. Trust me. Cue National Lampoons Christmas Vacation please. 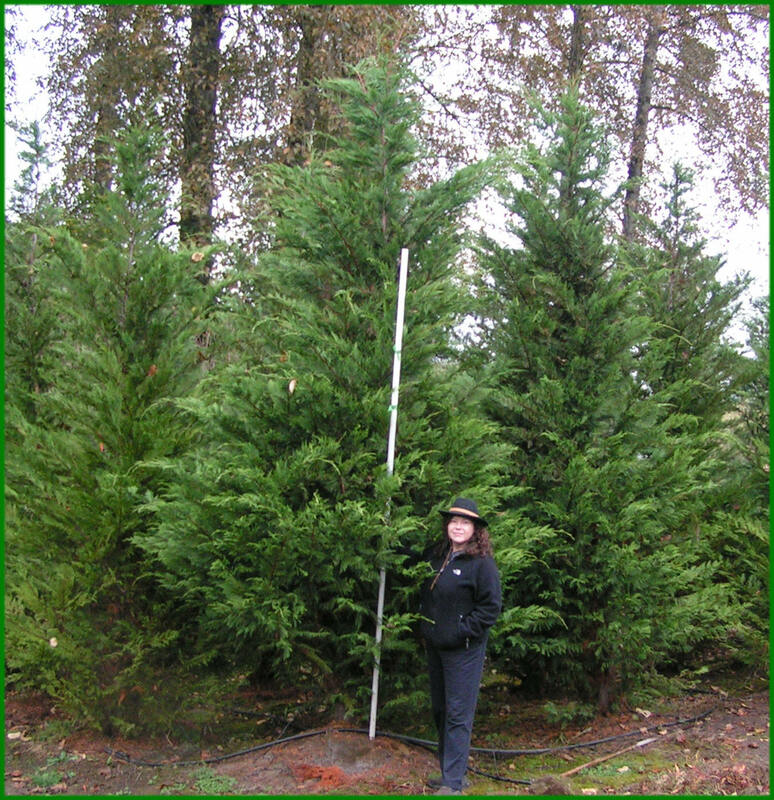 Here is a picture I Googled of a Leyland Cypress. These trees can grow to be very tall. Thank you Ranger Jane for the showing us just how tall they can grow. 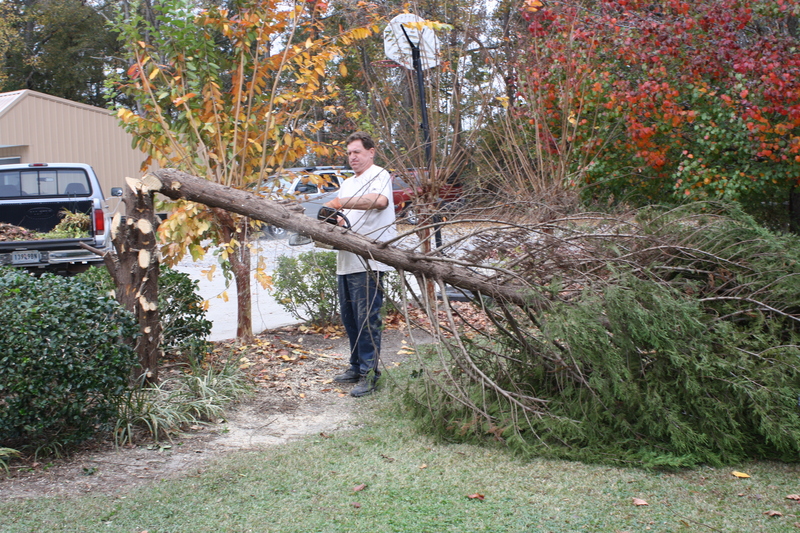 My father-in-law started whacking on his tree before I could get a picture. This is what his tree looked like when we pulled up. It originally looked like the one in the picture above. I have no clue how this baby keeps finding his way in these photos. 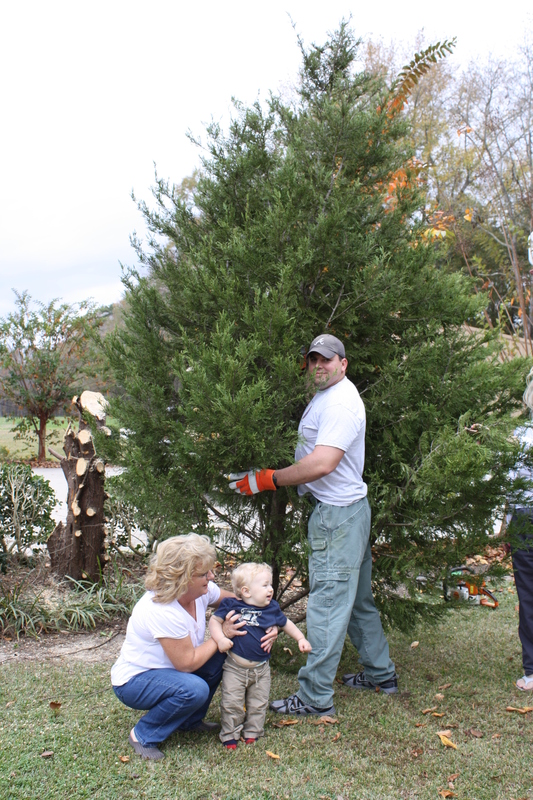 Also pictured is Clark’s son, Russ, holding the tree up, as well as Evan’s great-aunt Val. 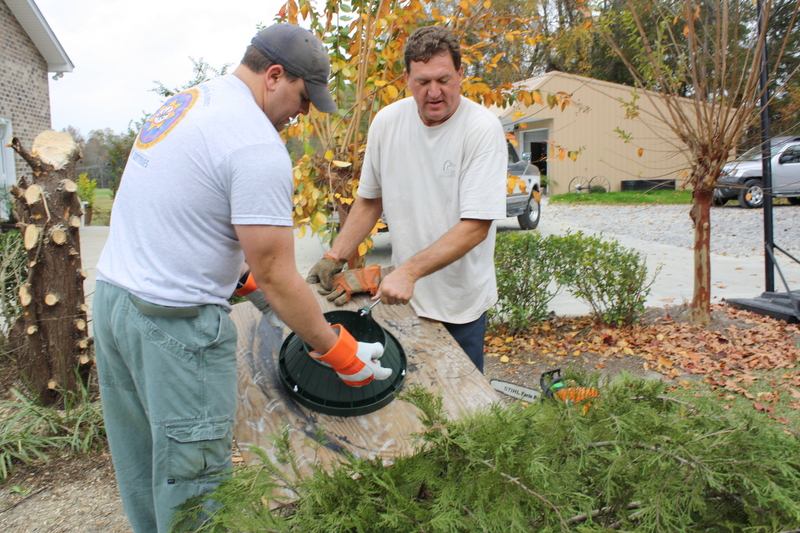 Clark and Russ Griswold trying to fix the tree stand. 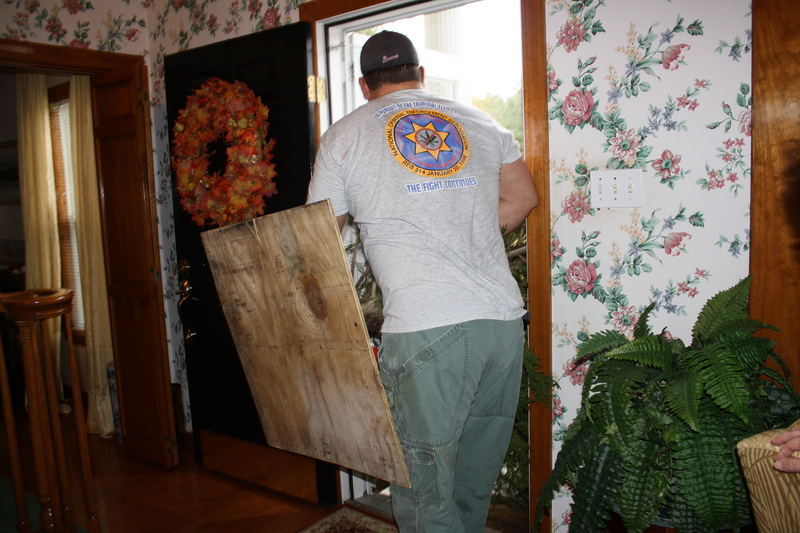 Trying to get it through the front door. It’s beginning to look like a Christmas tree. All done! There it is. 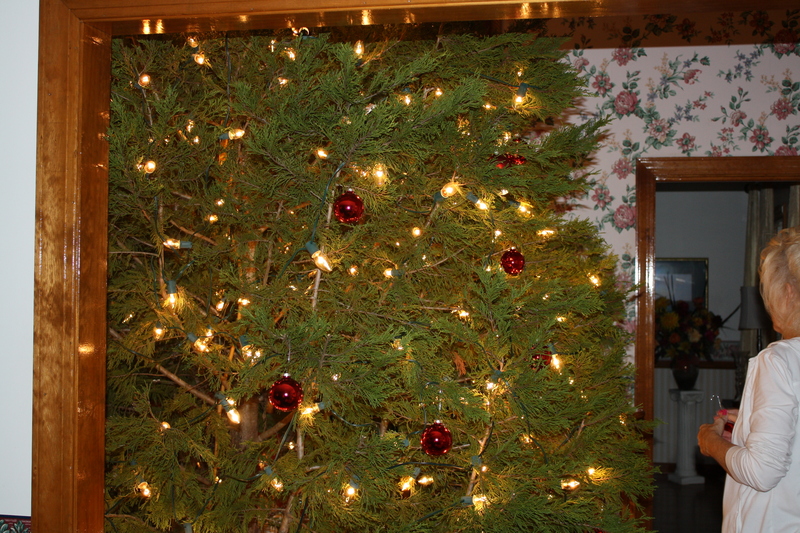 All 13.5 feet of tree. It is quite apparent that this family has watched Christmas Vacation way too many times. I can report however that no squirrels flew out of the tree.